What really happens after societal collapse? 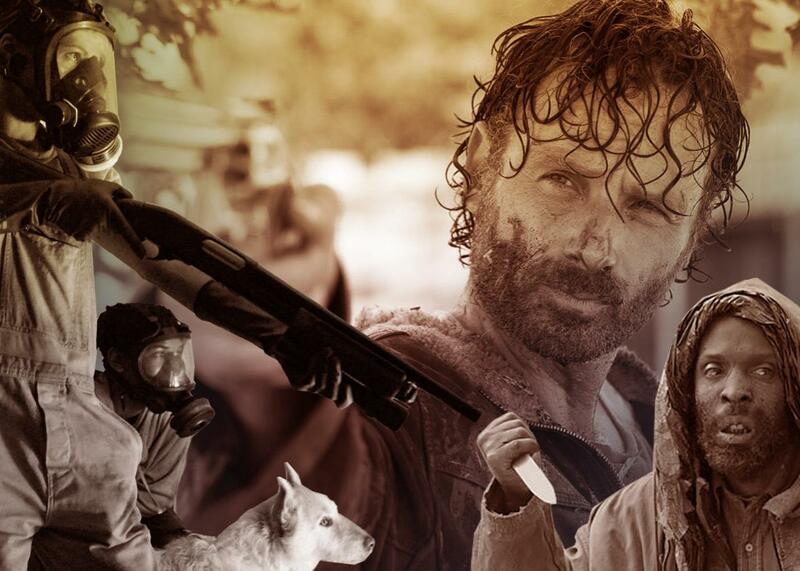 Apocalyptic visions tell us it’ll be every man for himself, but some historians suggest The Walking Dead has it all wrong. Photo illustration by Slate. Images via A24 Films, AMC, and Dimension Films. Most of the apocalyptic movies, books, and TV shows I’ve consumed have, like Night, taken an extremely dim view of human nature. Prepper fictions assume that weak “takers” will try to mooch off of better-prepared “makers” in the wake of the flu or an electromagnetic pulse, and that the makers will need to terminate the takers with extreme prejudice. Even more literary apocalypses feature chained-up human livestock in basements and infants on spits. I had to finally stop following The Walking Dead, once one of my favorite shows, because I couldn’t stand to watch the baseball bat scene. “There’s no trust in [the show’s] world, no kindness, unless it’s exhibited by some soft-hearted fool who’s about to end up as walker chow,” my colleague Sam Adams wrote after that episode aired. In a 1961 paper (unpublished until 1996), sociologist Charles Fritz laid out the case for this “contrary perspective” that disasters and other majorly stressful events don’t necessarily result in social breakdown and trauma. Fritz, who had begun his observations of disasters while stationed in Britain during the Blitz, reported that during that time he saw “a nation of gloriously happy people, enjoying life to the fullest, exhibiting a sense of gaiety and love of life that was truly remarkable,” with Britons reaching beyond class distinctions, sharing supplies, and talking to people they had never spoken with before. Marshaling sociological and historical evidence, Fritz recounts example after example of people pulling together in the middle of tragedy: black and white police and militia members uniting to maintain order during the yellow fever epidemic in Memphis in 1878; enemies forgetting old quarrels during the German bombing of Krakow in World War II; community members reporting strengthened personal relationships with neighbors after the White County, Arkansas, tornado of 1952. Scholar Ilan Kelman runs a site called Disaster Diplomacy that collects case studies, trying to determine why some disasters lead to greater cooperation between groups and others don’t. In one post, Kelman explains how the United States and Cuba negotiated (mostly failed) offers of mutual aid after hurricanes throughout the 2000s. “Disaster-related activities can catalyze diplomacy, but are unlikely to create diplomacy” where none existed before, Kelman wrote. If two parties—countries, or groups inside countries—have been talking about extending mutual aid and friendship already, help is likely forthcoming. If they haven’t—according to the case studies Kelman and others have gathered—it might not be. During a big and ongoing collapse, like the one climate change (or an international pandemic) is likely to be, people’s actions will be increasingly difficult to predict, because so many countries will be involved. People are not the same everywhere and across time. I know this argument doesn’t make excellent fodder for horror films. But there are fictions that approach the imagination of disaster carefully, without assuming that “humanity” is a constant across situations, and that scarcity will always end in war. In Kim Stanley Robinson’s new climate change book New York: 2140, most of the city is submerged by rising sea levels, but new organizational structures also spring up to allocate the resources that remain. This is not an idealized future—people go hungry, and predatory capitalists profit—but it’s not dystopian either. Characters form alliances and friendships, fight for one another, and share what they have.